Bonny Eagle High School football Coach Kevin Cooper, above, says the Patriots’ Bill Belichick has the ‘coaching edge’ in Sunday’s Super Bowl game. BUXTON — A local football coach advises fans to look for some likely tactics in the Super Bowl LIII matchup between the New England Patriots and the Los Angeles Rams in Atlanta. Kevin Cooper, who has coached the Bonny Eagle High School Scots football team to six state titles, last week analyzed the Super Bowl from a coach’s perspective. Cooper played linebacker at Dartmouth College and later served six years as an assistant coach at University of Maine. 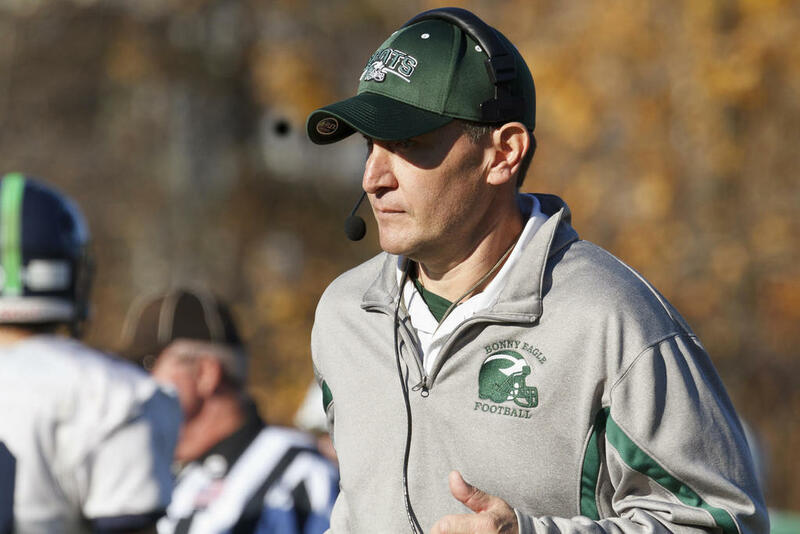 He is in his 21st year as head football coach at Bonny Eagle. He believes both teams will want to run the ball. But, Cooper said, New England quarterback Tom Brady could throw the football 50 times if the Rams allow the opportunities. “The Patriots’ passing game is predicated on a lot of short passes,” Cooper said. He said the Rams are a pretty good “run-the-ball” team and their quarterback Jared Goff had a great season. “They like to play action a lot,” Cooper said. Patriots Coach Bill Belichick will diagnose what the Rams do best and stop that, Cooper said. He said Belichick will use a variety of mixes to rush Goff. “Patriots want to control the quarterback,” Cooper said. On the other sideline, Cooper said Rams Coach Sean McVay will want to pressure Brady up the middle to move him out of the pocket. McVay, 32, is the youngest head coach in a Super Bowl. Belichick, 66, is the veteran in his ninth Super Bowl appearance with the Patriots, winning five. “Give the coaching edge to the Patriots,” Cooper said. “My guess is they’ll have a trick play in their game plan,” he said. The big game will be the place to be come Sunday. Westbrook fan Collin Joyce will fly to Atlanta to experience his first Super Bowl. Joyce and a hometown buddy will link up with another pal in Atlanta. “I’m a Patriots fan,” Joyce said, and he’s picking them to win. With the calendar and clock running down to Sunday’s coin flip, Super Bowl tickets were still available this week from Dan McCarthy of Tickets Unlimited Inc. in Westbrook. McCarthy said Tuesday the price of tickets has ranged from $3,200 up to $27,000. For fans traveling to Atlanta, McCarthy said ,Super Bowl party tickets were $750 and up. For fans staying home, the game will air on CBS.